The Arduino Platform is a great way for learning about electronics and programming, as well as creating microcontoller based projects. But even simple projects can get messy very quickly, leaving you with a pile of wires, breadboards, and components. With the RobotGeek Sensor System, you can put your project on the fast track and get it up and running in no time. 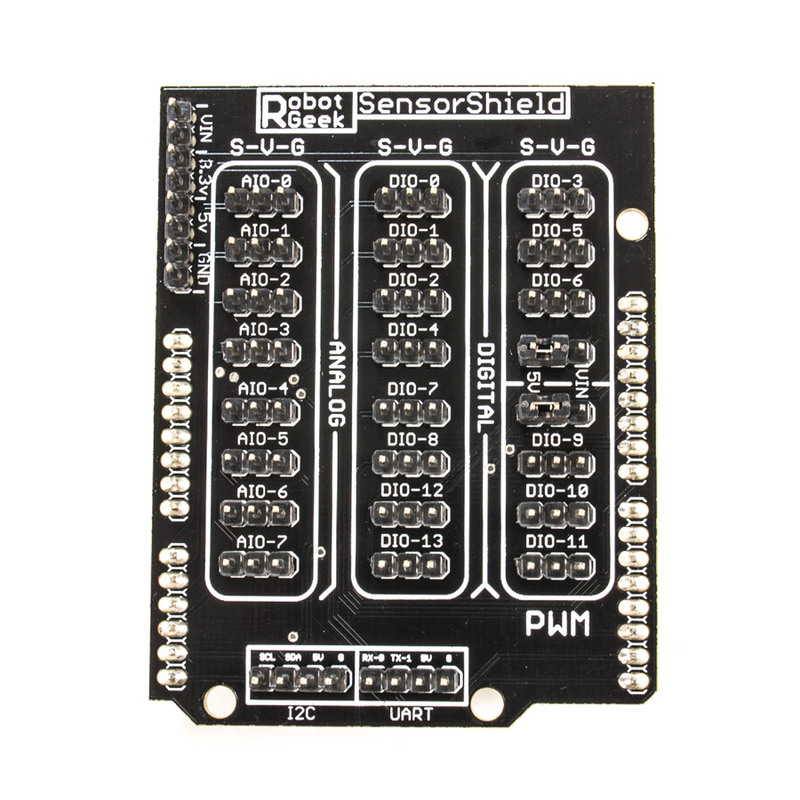 The RobotGeek Sensor Shield will fit on any Standard Arduino Compatible board*, and break out the digital and analog pins into easy to use 3-pin connectors. 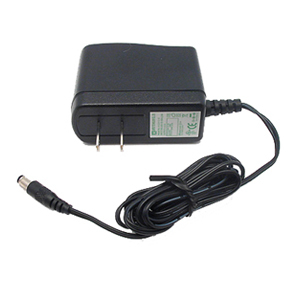 Each connector supplies 5 volts, ground, and a signal pin. 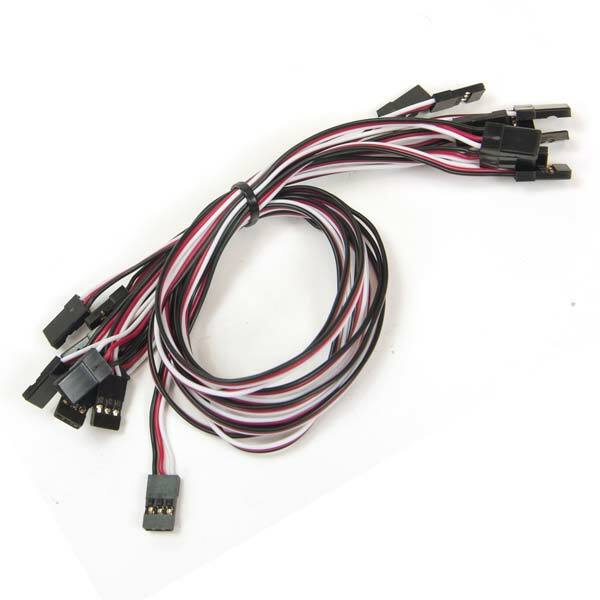 These connectors can easily be connected to RobotGeek Sensors as well as a wide variety of sensors, actuators and output boards. 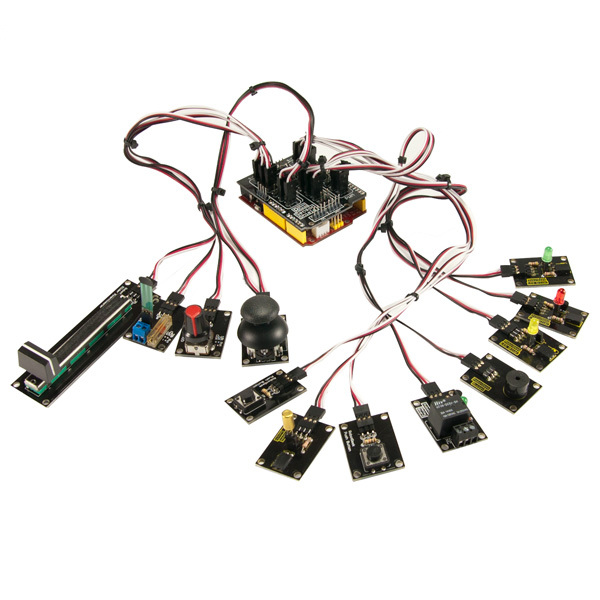 The Arduino does a great job of controlling PWM/RC Servos, making them ideal for a variety of robotic projects. But sometimes powering these servos can be a problem. Powering servos off of the Arduino's 5v regulator leads to underpowered servos, limited by the Arduino's built in regulator. 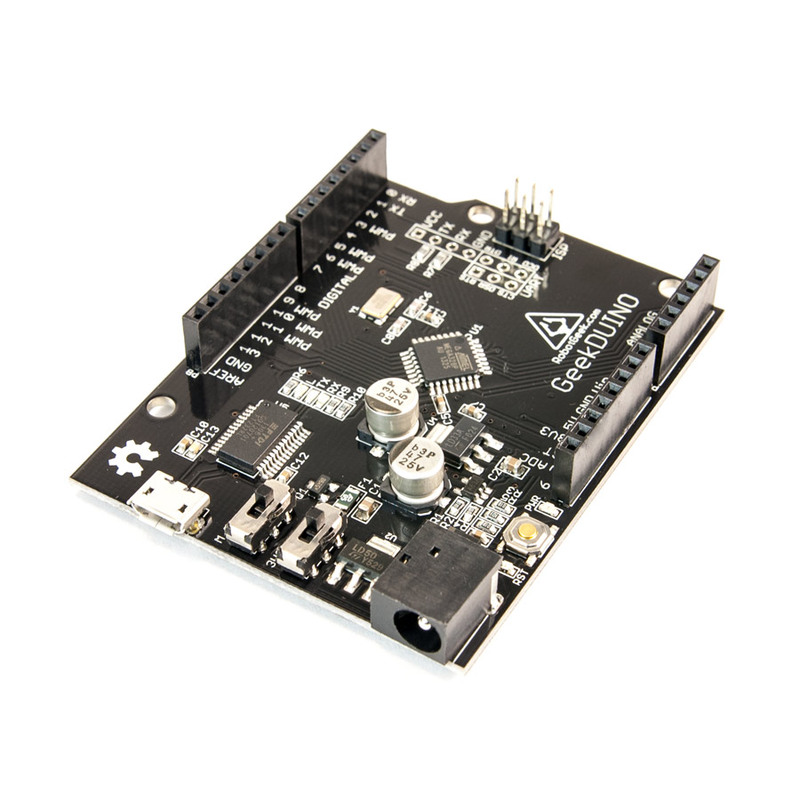 With other sensor systems, connecting a servo to an external power supply requires multiple cables or boards, defeating the purpose of a sensor shield. The RobotGeek Sensor Shield solves this problem with 2 jumpers to control the output voltage of the 6 PWM channels on the Arduino. Just move the jumper from '5V' to 'Vin' ans your servo will start to draw power from your Arduino's input voltage supply. 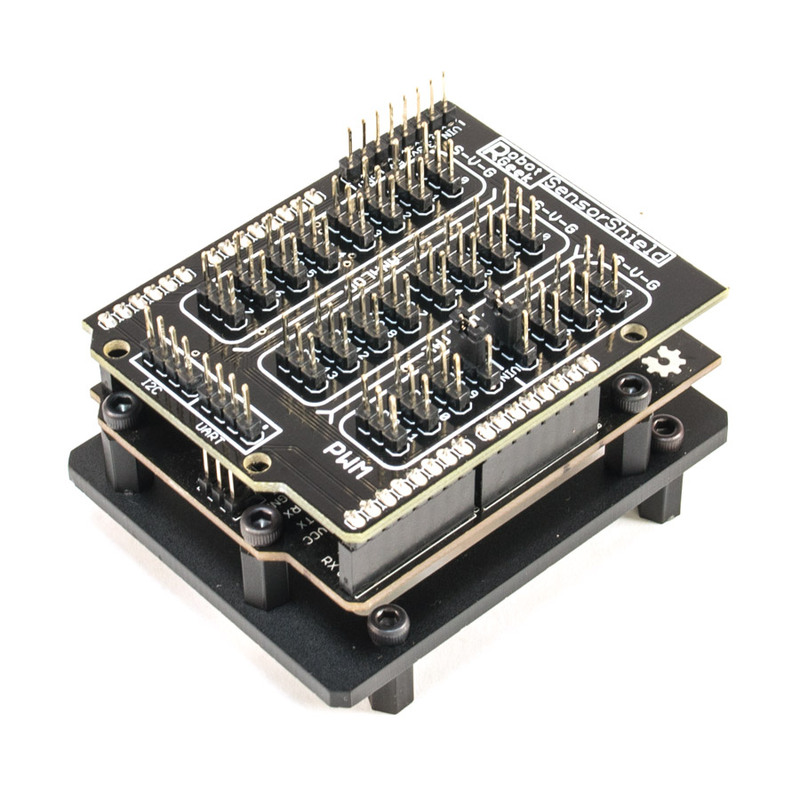 And since there's 1 jumper for each 3 PWM channels, you still have the flexibility to add a variety of sensors to your project. 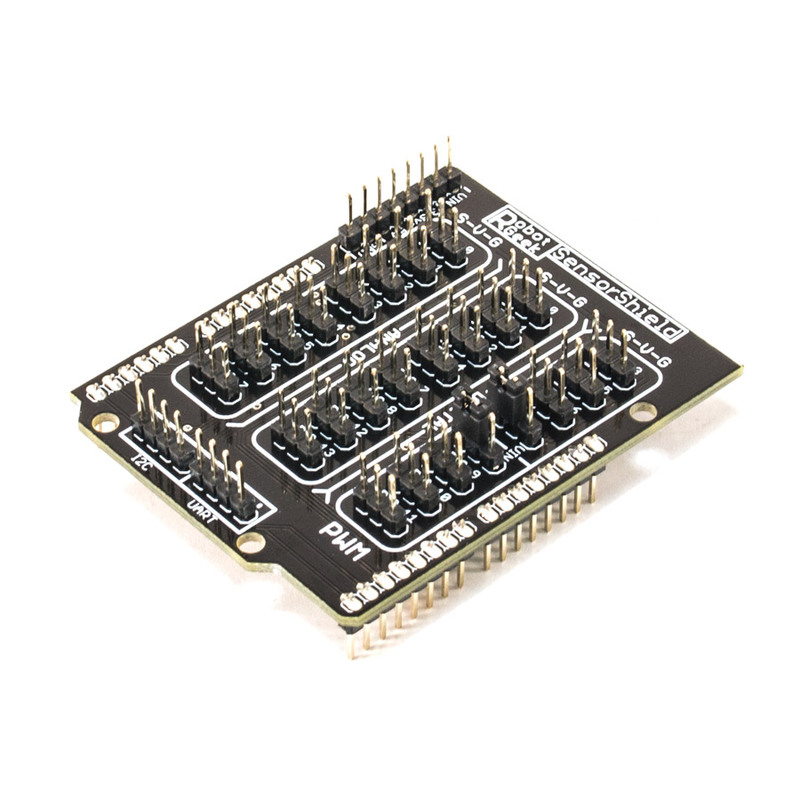 *While all Grove sensors have a 4-pin connector, not all of them use all 4 pins. Scratch Sensor Shield Example - Coming Soon!